Latest post Sun, Jan 13 2019 4:25 PM by Job ter Burg. 3 replies. Last week I added a TC Electronic Clarity M Surround to editing arsenal. 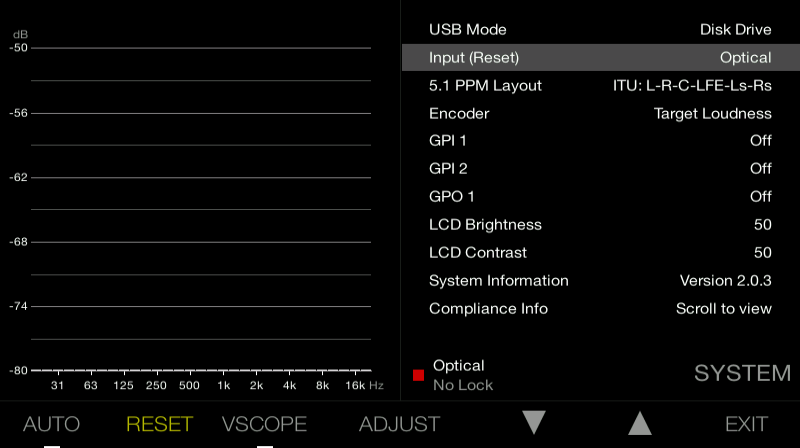 After successfully updating my new device to the latest firmware, I am having problems to get the optical input (input 4 - Toslink) getting to work, so that I can monitor my audio in real-time. I have connected the Clarity M Surround with the output (SPDIF/ADAT) of my Avid Nitris DX. USB Mode is set to Disk Drive. Input (Reset) is set to Optical. At the lower part of the screen, the little square is red and says No Lock. Is there anyone knowing what I am doing wrong? The Plug-in mode works without any problems in Media Composer, but this gives me no balance-o-meter, true peak meters, RTA, vector scope. Thank you very much in advanced for your help! Have you enabled this output in the settings inside MC? Also, are you sending it stereo or 5.1? I don't think the Clarity will accept anything more than stereo over optical. And if it does, it might choke on 8ch versus 6ch? Just a stab in the dark. You were right. The optical output was enabled, but was set to ADAT instead of SPDIF. I completely overlooked this. Problem solved and working like it should! Thanks again for your help and lots of greetings from a southern neighbor.